At least eight people are dead, including six senior citizens, in a fiery bus crash. The bus was carrying a church group back to North Carolina when it blew a tire and slammed into a tractor-trailer and sport utility vehicle. NBC's Tom Costello reports. Worshipers flocked to a North Carolina church Wednesday night for news and solace after eight people were killed and 14 others were injured when a bus carrying elderly members crashed into two other vehicles and overturned in eastern Tennessee. As many as six of the eight people who were killed were believed to have been members of the Young at Heart program for senior citizens at Front Street Baptist Church in Statesville, north of Charlotte. All 14 of the injured were described as senior citizens, two of whom were in critical condition late Wednesday. "I'm worried about my brother," a man at the church told NBC station WCNC. "He might be hurt. I'm hoping he's still alive." Police cars ringed the church Wednesday night, trying to keep reporters and onlookers at a distance during an emotional evening service. "We're thankful for the time that we've had here in the sanctuary," the Rev. Rick Cruz, one of the church's pastors, told reporters afterward. "At the church, we've just had a gathering of prayer in which much of the church family came together and just gave thanks to our God." Cruz said there was still little information on the identities of the church members involved in the accident, "but we do know that there were several that went on to be with the Lord." "This is a time of difficulty," he said. "But we trust in God. We trust that he is fair always, and so all your prayers are appreciated at this time." Church member George Stadtfeld told reporters: "We're all shaken. As bad as it is, they're all Christians, and I know where they're at. I'll join them later." The crash Wednesday overturned the church bus and engulfed a tractor-trailer in flames. The bus was carrying 18 people, including the driver, when it overturned about 2 p.m. ET, said Tennessee Highway Patrol Sgt. Bill Miller, who called the accident a "very horrific event." It was taking the Young at Heart members back home to Statesville from the Fall Jubilee Conference, an annual preaching and gospel music gathering in Gatlinburg, Tenn., the church said. Miller said a front tire blew out as the bus was traveling east on Interstate 40 east of Knoxville. The bus crossed the median and struck a tractor-trailer and a sport-utility vehicle carrying three people, overturning the bus and setting the tractor-trailer on fire, he said. Eight people were killed, authorities said — six on the bus and one each in the two other vehicles. "We hope and pray that there will be no more," Miller said. Jefferson County Emergency Management Director Brad Phillips said the crash was the worst accident in his 21 years with the county. "It was a tragic day today," he said. The University of Tennessee Medical Center in Knoxville was treating 14 elderly patients. Two remained in critical condition late Wednesday, and seven were in serious condition. The rest were stable. "We saw bodies all over the ground and some people walking around," said Fred Lucas, who stopped to lend assistance. 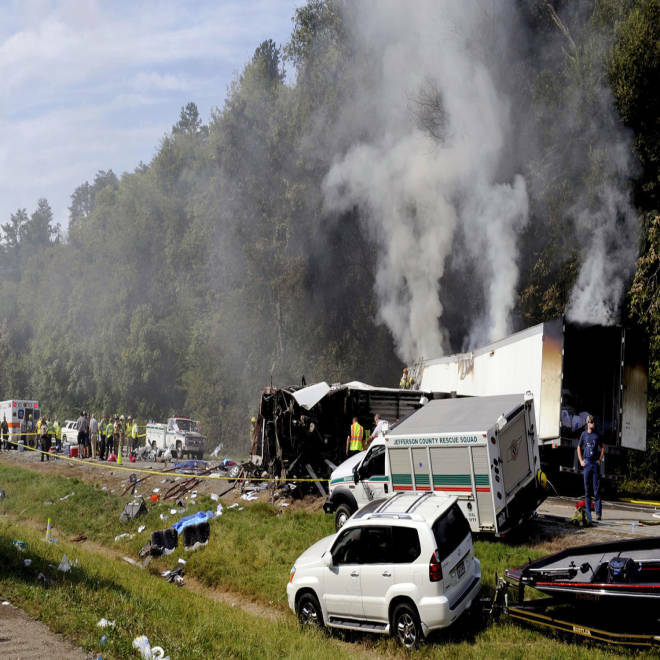 Lucas and his wife, who are doctors at the University of Cincinnati Medical Center in Ohio, were driving to Asheville, Tenn., when they spotted the smoke from the crash, The Knoxville News reported. Their doctors' instincts kicked in, and both Lucases began helping with a makeshift triage effort. "Just get them away from the fire — figure out who was alive and who was dead and get the live ones first," Lucas told the newspaper. "I didn't even stop to figure out who was who. There wasn't any time for that." In a statement, the organizers of the Fall Jubilee called the accident "a tragic loss." "All the Jubilee team have you in our prayers," it said. Niven McCall-Mazza and Edgar Zuniga Jr. of NBC News contributed to this report.